Our solid-state DC Motor Driver is a highly-ruggedized control platform for variable-speed DC motor control. 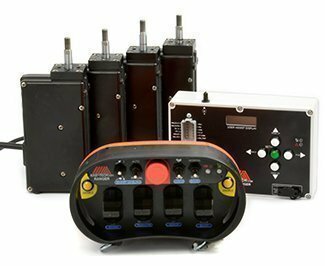 With high-current, factory bridgeable outputs, it can be used to control either four 25A DC motors (45A peak), two 50A DC motors (90A peak), single 100A motor (180A peak), 8(25A) proportional or on/off outputs suitable for hydraulic valves and other industrial equipment. In addition to the motor control outputs, CANbus via J1939 is on board, and up to nine analog inputs. Where we think the motor driver really shines is that it can be built with our wireless control modules on board, to directly accept control inputs from almost any of our wireless radio transmitters. The electronics are housed in a custom anodized aluminum chassis designed to rapidly dissipate heat, and the unit is totally encapsulated for the ultimate in shock, vibration, and all-weather resistance. 8 Maximum, 0-Supply Voltage (12/24VDC), 12-bit resolution with onboard 5VDC regulated analog reference for sensors. Inputs are protected for over voltage/transient spikes. 7 wires, 18 AWG GXL in a flame retardant mesh loom.